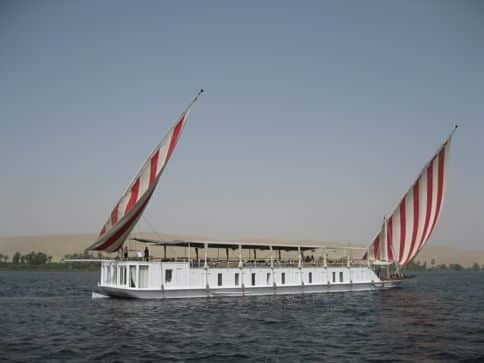 Begin your remarkable journey on the Nile on a 19th-century dahaybieh with an Egyptologist who shares the life and times of ancient Egypt. From these luxurious boats, modeled after pharonic barges, you can observe the scenes of centuries ago. See the sugar cane harvests, the fisherman pulling in their nets, and the water buffalo along the shore. When the boat docks, experts will guide you through iconic pyramids, temples and places of antiquity that have survived thousands of years. Like the aristocrats in their time, dine on the romantic dahaybieh under the starlit sky and watch the moon rise over the world’s famous river. Before your sail, explore the famed Valley of the Kings. There’s King Tut’s tomb (hurry before it closes to the public!) and Hatshepsut’s temple, plus new tombs that are being discovered and excavated even while you visit! Discover the mystery of the Rosetta Stone and fanciful tomb stories told by hieroglyphics. Then round out your journey with a visit to Cairo’s chaotic markets and bazaars in Khan El Khalili, which are remarkably similar to the original 14th century operation. You can sleep in a Cairo hotel that’s got an authentic manual elevator, and learn how to eat pigeon (that means bones and all). Marvel at King Tut’s toenails on his mummy at the Egyptian museum, then climb inside the Great Pyramid of Cheops, the largest and oldest of the Pyramids of Giza. Contact Melanie for information on the many incredible ways to experience the exotic culture of Egypt!